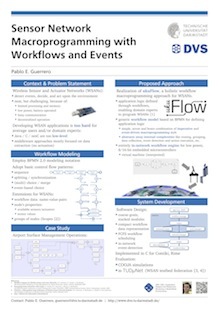 ukuFlow is a workflow engine for wireless sensor networks and energy-efficient networked embedded devices. With ukuFlow, developers model the application logic using processes, or workflows, as programming abstraction. This macroprogramming approach enables domain experts to focus on the application logic, hiding away low-level system issues. The main goal of ukuFlow is to provide a system that runs entirely in-network. Users first define their process logic using a process editor in an IDE. An off-network converter maps the logic to a compact format, which is uploaded to the network via a serial connection to a sensor node. From there on, the ukuFlow engine takes over by instantiating and running the workflow as specified, with no need for a back-end controlling the execution. ukuFlow adopts a standard notation called Business Process Model and Notation (BPMN) v2.0, which we extend with a set of abstractions for its suitability to sensor networks. Processes are modeled with the help of an IDE, particularly an open-source Eclipse plug-in enhanced with our toolchain to convert and deploy process into a running sensor network. Want to find out more? Take a look at our current poster (image to the right). ukuFlow is written in the C programming language. It is implemented using Contiki, therefore it runs on a variety of platforms. We do focus, however, on the MSP430-line of sensor nodes like the TelosB and the Z1. ukuFlow is available under a BSD license. We strive to include as much source code (doxygen) documentation as possible. Our nightly builds update all the html files, which can be accessed here. Steffen Kilb. Technische Universität Darmstadt, 2009. German. ukuFlow is a compound name, coming from uku ('U'uku is hawaiian for tiny) and flow (from work-flow).